now try and say that!! almost sounds like another "f" word we know, eh? but we love saying it!! We had a great BBQ the other night , put on by the Yacht Club. its kinda funny as the yacht club members here don't have any boats. but we joined! getting our burgy too. we had a great feast, they even picked us up in a bus and took us to the coral gardens restaurant , where the toughest golf course is. did some banjo playing and sing !! just a great time. 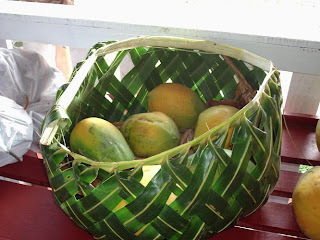 Friday morning is market day, quited the different market than what we had in Raratonga!! very small, but just as fun. 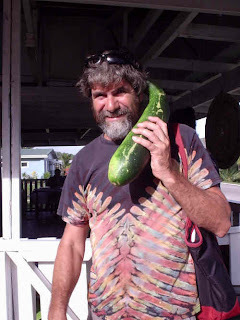 lucked out and got cucumber and even zuccini - it was huge and cost $7 check out Steve using it as a phone . 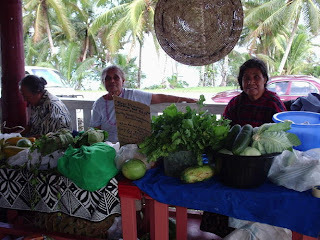 we got lots of good fresh food and even saw some of the ladies from the weaving class, they have told me to be there again on Tuesday and to bring my beads. They want to see what I make. Bingo again this afternoon, only its for cash - darn I wanna win a pig!! tee hee. Niue is one of the world's safest destinations, and one of the few countries in the world where crime is almost unheard of. It's also free of any harmful animals or insects! Niue is a large upraised coral atoll, and is the only land mass in the centre of a triangle of Polynesian islands made up of Tonga Samoa and the Cook Islands. Located 2400 km north of New Zealand, Niue is 11 hours behind GMT. The island's isolation and coral makeup creates an exciting rugged coastline and reef which provides intimate swimming coves as opposed to the typical long stretches of sandy beaches so predominant elsewhere in Polynesia The whole island is dotted with a myriad of caves. There are less than 1500 residents. they have dual citizenship, as an independent nation in free association with NZ. Well HELLO Tremblays!!!! It seems forever since I checked out your travels! I guess it has cuz i missplaced all your info and found it again today while cleaning thru a shoe box!!! Never know what you'll find in my world!! It so wonderful to read all the stories of your adventures! Glad to see how well you're all doing!